Golden Retrievers are immensely popular. However, their size has made it impossible for some to bring the loyal, affectionate breed home. The Miniature Golden Retriever is a “designer dog” that, on paper, can combat this issue. But are these smaller dogs big on the things that make Goldies great? Unlike a lot of designer dogs, the Miniature Golden Retriever seems to have a more concrete origin story. Its roots trace back to the early 2000s, when a breeder from Kentucky combined a Golden Retriever, a Poodle, and a Cocker Spaniel. After a few years, the Spaniel was dropped from the mix because of its aggressive tendencies. The resultant Golden Retriever/Poodle mix even has a trademarked name: The Comfort Retriever. With that being said, as more breeders have jumped into producing this hybrid, a few have reverted to the original three-dog design. This, then, produces a rather unique wrinkle in the process of acquiring the dog. Because there is a known variance as to how the hybrid is created, it’s important that you ask if the Comfort Retriever has any Cocker Spaniel. The inclusion of this third dog can potentially alter the pooch’s persona. With that being said, the Comfort Retriever was designed for one sole purpose: to give people that didn’t have the space to care for a Goldie the chance to bring home a smaller version of the dog. The genetic makeup of the hybrid is proof of this. A typical Comfort Retriever’s genetic makeup will range from 50 to 75 percent Goldie. As one may guess, this Goldie-heavy design produces a pooch that has strong physical Goldie traits apart from its size. The double coat, color, wide muzzle, expressive eyes, and floppy ears are all directly linked to a Goldie’s DNA. However, if a Comfort Retriever does have some Spaniel genetics, the coat may be singular and curly. Just because the hybrid is designed to be a Miniature Golden Retriever, this doesn’t mean you’ll have a toy breed on your hands. The Comfort Retriever usually weighs between 20 to 50 pounds and stands around 14 to 20 inches high. What Kind of Personality Does the Comfort Retriever Carry? Because we can pinpoint the origins of the Comfort Retriever with significantly more accuracy than other hybrids, a lot of the guesswork that may be part and parcel to other hybrids doesn’t exist here. It’s pretty much accepted that these smaller dogs act like Goldies. As such, these pooches are energetic working dogs that are intelligent enough to carry out complex tasks. Their DNA plants a need to do a job within their noggin, so they will be on the lookout for something to do – even if it’s a simple game of fetch. The Comfort Retriever is also a fiercely loyal family dog that will find ultimate happiness simply by being near the ones he loves. He’ll have no problem indicating his feelings through the characteristic smile that makes regular Goldies so endearing. Since he’s smaller, you may experience a greater instance of accidentally bumping into him unseen. Like his grown-up cousins, the Comfort Retriever isn’t much of a barker, so he’ll make a pretty lousy watchdog. In fact, he’ll be much less effective than a full-grown Goldie, who at least can unwittingly use his massive size to intimidate. While Comfort Retrievers love to play, they are best equipped for hanging out indoors. Fortunately, their compact size makes it a whole lot easier for owners to accommodate this need. Their size also makes them a great dog for kids, especially when you consider the hybrid carries a Goldie’s famous gentle disposition. There is one asterisk to all of this. If the Comfort Retriever does have some Spaniel DNA, he may exhibit a little snippy aggressiveness. If you want to avoid this potential tendency, it’s important that you ensure the reputable breeder you’re working with does not involve any Spaniels in the breeding process. The distinctive look of a Comfort Retriever can be a bit trippy, particularly because they tend to look like Golden Retrievers as advertised. This video showcases just how close these sweet dogs look in comparison to the “real thing.” The dogs in this video are expecting, so their size may be slightly exaggerated. What is the Temperament of a Comfort Retriever? The Comfort Retriever is a high-energy dog whose playful instincts do not fall far from the traditional Goldie tree. This means that the hybrid is a pooch that needs plenty of exercise and activity in order to remain happy. It’s recommended that you provide the dog with at least 30 minutes of hearty exercise. The big bonus with a Comfort Retriever is that the dog is suitable for apartment living, provided that you meet his exercise needs. This represents a paradigm shift of sorts from the traditional Goldie, who simply does not handle apartment life well. That said, it does help if your smaller guy has access to a yard. Like the traditional Goldie, a Comfort Retriever’s terrific loyalty streak means he’ll happily adapt to your own exercise regimen. As such, you can count on a companion for jogs, long walks, or swimming in your pool. Just be sure to monitor his activity – the dog will push the limits of his energy if you allow him to. Because the Comfort Retriever is a brainy dog, it’s important that you provide your pooch with a proper amount of mentally stimulating activity. This could be as simple as giving him a puzzle toy or tossing a tennis ball around in the backyard. Because he’s a working dog, he’ll look at these fun pursuits as a job that must be executed. Is Training a Comfort Retriever Difficult? A Comfort Retriever is well-suited for an easy training experience. The hybrid has a winning combination of being bright, eager to please, and willing to listen to commands. While this doesn’t mean the dog will be a perfect pooch overnight, it does mean that you’ll have far less of a battle on your hands. If you have a Comfort Retriever that has some Spaniel DNA, you should devote a little extra time and patience to training than you otherwise would. This is particularly the case regarding socialization, as getting your pooch used to being around other people and dogs will help tamp down the dog's aggressive Spaniel tendencies. Do Comfort Retrievers Require the Same Amount of Grooming as Goldies? Goldies can be rather infamous for the amount of hair they leave behind. However, the Comfort Retriever tends to shed far less, to the point where some consider the dog to be hypoallergenic. 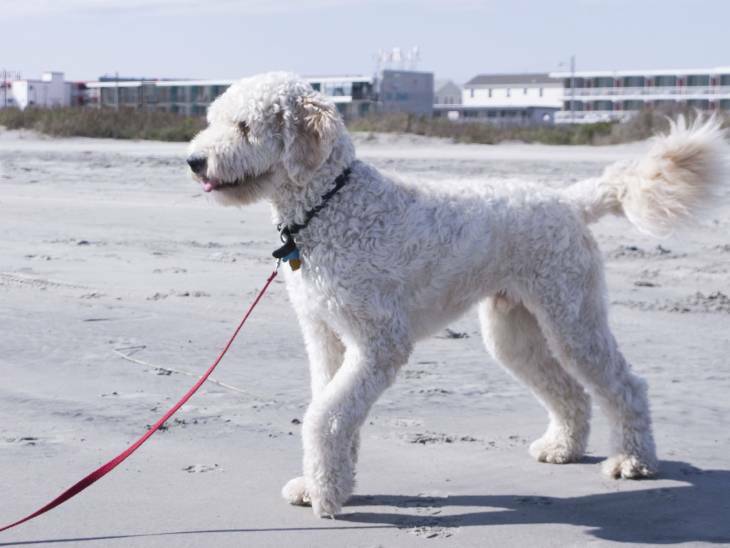 Part of the reason for this is the dog’s size, but another reason stems from the Poodle end of his genetic code. Even though the Comfort Retriever isn’t much of a shedder, the dog’s double coat does require brushing two to three times a week to keep it looking shiny and healthy. You’ll also need to take care of the usual grooming stuff like ear wiping, tooth brushing, and nail clipping. Is the Comfort Retriever a Healthy Dog? Like all other designer dogs, the health concerns of a Comfort Retriever are relatively unknown. This is because the dog's history only stretches back to the previous decade. However, because the dog's genetic code leans so heavily on a Goldie's DNA, one may be able to look at that breed's health concerns for a more robust health outlook. For instance, Goldies tend to have a predisposition for eye issues, joint dysplasia, allergies, and skin problems. As such, it seems fair to anticipate the possibility of such issues manifesting within a Comfort Retriever. It also should be noted that the hybrid could have a tendency for diseases linked to Poodles, like patellar luxation. How Much Does a Comfort Retriever Cost? Arguably no other designer dog has a wider range of initial cost than the Comfort Retriever. You may be able to find one for as little as $700, or for as much as $6,000. While this gulf is caused by the usual mitigating factors such as age and breeder, it’s also driven by demand – remember, this is essentially a mini version of the country’s most beloved dog. This hefty price tag does not take into account the other long-term costs typically associated with dog ownership. As you calculate the dog's overall affordability, be sure to include things like licensing, vet trips, neutering, food, and other key canine accouterments. If this puts you out of the dog's price range, look elsewhere for the sake of the pooch. If you can swing the cost of owning a Comfort Retriever, and can meet his exercise requirements, you’ll find this hybrid to be the dog of your dreams. Sweet, loyal, an energetic, this smaller dog has all of the qualities that make a Goldie so loveable without the space a Goldie requires. You may never go full-size again. Pup Pricing: How Much Does a Standard Schnauzer Cost?